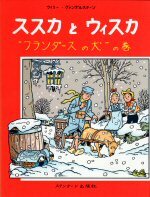 The adventures of "Suske en Wiske" have been published in many languages. The translators of the stories often also adapted the names of the characters who appear in the adventures. At this page you'll find an overview of the names used in the various publications. For each language the main characters, as far as their names are known, are listed. Next are the lesser important characters and last the names of other series from Vandersteen when they're mentioned in the original publications. Information about translations in the following languages are available: Afrikaans, Basque, Brabants, Brazilian, Chinese, Danish, Dutch, English, Esperanto, Finnish, Flemish, French, Frisian, German, Greek, Icelandic, Indonesian, Italian, Japanese, Latin, Limburgian, Norwegian, Persian, Polish, Portugese, Russian, Spanish, Swahili, Swedish, Tibetan, Tamil. The names from the red series "Suske en Wiske" were taken as a referencepoint throughout this list. In Afrikaans the name of the series is Neelsie en Miemsie Adventures were published in Klik. At the end of 2011 the movie The Texas Rangers was released in 2011 en 2012 vertoond in the Basque country. The names of suske en Wiske were equal to the ones used in the English version of the movie, Luke and Lucy. One of the very old series is the Brazilian one. Chinese albums have been published in both Taiwan and China. Since the introduction in the Netherlands in 1946 till 1967 when Dutch and Flemish editions were no longer seperate series, various names of main figures and others were changed. However Suske and Wiske themselves remained unchanged. Chive Gormando, the leader of the fat guys opened a reducing salon, but when everyone became thin he became a dentist. The latest series Spike and Suzy was published from 1998 to 2001. At first, the producers of the movie The Texas rangers used the names Spike and Suzy for the English version. In the Fall of 2008 the names Luke and Lucy popped up. After the introduction of the title Luke and Lucy for the cinematic version of The Texas rangers these names were used by Standaard Uitgeverij for subsequent . Almost all major characters retained the names as use in the movie, with the exception of Lambik, who was renamed into Cooper. Although Flemish is in fact the one and only real series, this series stopped in 1964 when all new adventures were written in ABN which ought to be more civilised. Beside the changing in speaking, some names were changed. When the stories became full colored in 1967 all old stories were edited and reprinted (starting from 67 onward). Lala & Lili & Lolo ? Lasido & Remifa Lasido & ? Nello & Patrasch ? & ? Five issues were translated in Frisian, all names remained the same: Suske, Wiske, Sidonia, Lambik, Jerom, Barabas and Schanulleke. In German at least five different series of names were used. In the Suske und Wiske series issued in the seventies that covered mainly the Dutch Red sequence books, the character names were the same as in Dutch including: Barabas, Schanulleke, Arthur, Jef Blaaskop, Sus Antigoon and Lasido. This is also true for the names that appeared in the Austrian German books. In another Suske und Wiske series that was issued in the nineties and covered the first part of the Dutch Blue sequence books, the names of Suske and Wiske remained the same but Lambik is called Pankwitz and Priem is called Prim. Some stories were published in Felix. The names for the two title characters used in this journal were the same as in Dalla. But Lambik and Sidonia were renamed. In the sixties stories of Wastl appeared in greatquantities. We only know that Krimson appeared in some of the stories under the name Genio Macklespleen. NOVA drinkjoghurt once gave jig-sawe puzzles away. For the German speaking part of Belgium, Suske and Wiske were called Willy and Wanda. At the end of 2011 the first part of a new series was issued, with the titleSuske & Wiske. Eight stories have appeared in Italian. Two of these were published in the magazine Tintin, the other six in albums. One story De bokkerijders was translated in Limburgian De bokkeriejersj. The names of Suske, Wiske, Sidonia and Lambik were not changed. Barabas and Jerom did not have roles in this story. But in the viewpoint of the translators names should not be changed. Another dialectcommunity (Dialect Onderwijs Limburg) wanted to produce a Limburgian edition as well. In their opinion names should be changed. Then Suske and Wiske would become Frenske (from Franciscus) and Liza (from Louisa). No issue appeared. Some years later a second album, De kaartendans, was translated into Limburgian dialect as De joker aafgetroef. Lala & Lili & Lolo ? & Lili & ? Seven books have been published in Iran. In Latin script the names of the main characters are: Bobi va Bobet. No books of Suske en Wiske were published in Poland. However, the movie The Texas Rangers was broadcasted on Polish TV, in June 2011. The translation of the main characters' names were based upon the English edition of the movie, Luke and Lucy. In Brazil the series was published as Zé e Maria. In 2007 a new series started in Portugal. The title of this series was Bob e Bobette. The movie De Texasrakkers enabled Suske en Wiske to reach countries where they never had been known before. The movie was distributed in Russia as well. The names of the main characters used in Russian translation are derived from the names which were invented for the English edition of the movie, Luke and Lucy. The Bobette name for Wiske was used in some stories that were issued in the sixties. Some stories have been translated in Swahili. The title of the series in this language probably wasBob na Bobette. A number of stories has been published in Tamil. The image to the right shows the Tamil-edition of Het zoemende ei. The title of this album reads Bayangarap Payanam (The terrible expedition). The names of Suske and Wiske aren't present on the cover. Apart from the title only the text Mulu Neela Chitharakathai is printed, which means "Full comicbook story". Erik Tjong Kim Sang maintained this list from the beginning until November 1995. He stopped maintaining to take care of all his other pages including the European Comics on the Web page. Maarten Voncken (maartenv@sci.kun.nl) supplied two of the English names, two of the Latin names and the Latin book title. Kristian Ødegård (ko1@oslonett.no) provided the (difficult to find) Norwegian names for the less important characters. Alfons Moliné provided the names from the old Spanish series and the ones from Portugal. Ninni Sundqvist sent many names of some less important characters from the Finnish albums. A contribution by Pierre Justo enabled us to publish the correct names from the Chinese and Japanese albums. Jan Vincent transcribed many names from book in non-Latin script. Rob Webber helped us with the spelling of Danish names. Claudio Piccinini supplied several Italian names. Jo Desmet for info about the Tamil edition.